iPhone 6s Plus Price, Review, Deals, Cost, & Sales! Home / Compare Cell Phones / iPhone 6s Plus Price, Review, Deals, Cost, & Sales! With the longest lasting battery, most powerful processor, and sharpest camera, iPhone 6s Plus was the most powerful iPhone at the time of its release. The iPhone 6s Plus features a large, 5.5” Retina HD display with a 1920 x 1080 pixel resolution. The iPhone 6s Plus is a great choice for people who prefer a larger display, as it is 0.8” larger than the display of the iPhone 6s. This screen has a special coating that helps prevent fingerprint smudges, display zoom, and Reachability. Along with the 6s, the iPhone 6s Plus was the first iPhone model to have a built-in 12 MP camera, which takes much better photos and videos than the 8 MP camera in the iPhone 6. The iPhone 6s Plus camera has True Tone flash, optical image stabilization, up to 5x digital zoom, and much more. You can record videos in 1080p HD and 4K with this iPhone. This iPhone comes in two storage variations: 32GB and 128GB. The 32GB iPhone 6s Plus has twice as much storage space as the cheapest iphone 6 Plus, which only has 16GB of storage space. With so much storage space, you can save tons of pictures, songs, movies, and more! The iPhone 6s Plus speaker is located to the right of the charging port on the iPhone’s bottom edge. The enclosure of the iPhone 6s Plus speaker produced with 30% more recycled plastic than speaker enclosures of previous iPhone models. You can use one of your fingerprints to unlock your iPhone 6s Plus thanks to Touch ID. 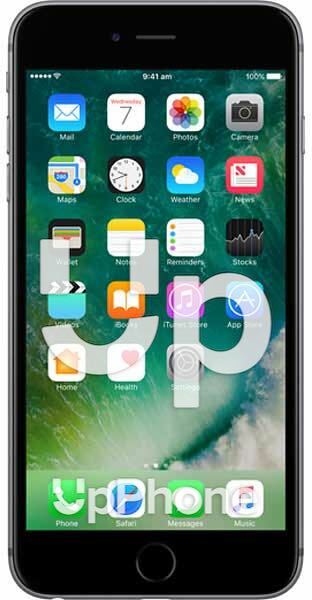 A small sensor has been built into the Home button of your iPhone 6 Plus, which can scan and identify your unique fingerprint. The iPhone 6s Plus has a A9 processor chip, a powerful upgrade from the iPhone 6 Plus, which was built with an A8 chip. The GPU of the A9 processor is about 90% faster than the A8 chip, and the processor of the A9 chip is approximately 70% faster than the processor of the A8. The iPhone 6s Plus battery lasts much longer than the battery of the iPhone 6s. You can enjoy up to 80 hours of audio playback, 24 hours of talk time, 14 hours of HD video playback, or 12 hours of internet use on the iPhone 6s Plus. The A9 chip was first used in the iPhone 6s Plus (as well as the standard 6s). The iPhone’s FaceTime camera received a huge upgrade from the iPhone 6’s FaceTime camera. The iPhone 6s Plus was the first Plus-sized iPhone capable of recording 4K video. iPhone 6s Plus was the first Plus-sized iPhone with 3D Touch technology. Apple originally released 16 GB versions of the 6s and 6s Plus, which were discontinued when the 32 GB version was released in late 2016. The iPhone 6s Plus battery can last up to 16 days on standby.